This is the third post in a series that is exploring the ways hybrid cloud-based and SaaS applications are driving a new approach to application delivery. In previous blog posts, we presented the overall challenges posed by hybrid cloud-based and SaaS applications and dived deeply into reliability. In this post, we continue by looking at how gaining visibility across your evolving hybrid multi-cloud environment aids in making better business decisions. Applications are an essential component of how today’s organizations do business and interact with their customers. As industries have grown more competitive, providing a strong customer experience through your application has become one of the most important ways that an organization can differentiate itself from its rivals. However, the shift to cloud environments over the past few years has introduced a few challenges and changes for application development. For one, IT leaders face a lack of visibility and control over security and performance as their software becomes more distributed. Applications that were once inside a company’s on-premises data center might now be deployed on Amazon Web Services or Azure. Right now, the future of enterprise computing looks a lot like hybrid and multi-cloud, which has many economic benefits, but which also makes IT environments more complex. What’s more, companies are now developing their applications in an entirely different way. Driven by web technology giants, such as Netflix and Facebook, one major development trend is to use multiple smaller components that all communicate with each other, such as in the micro-services architectural pattern. This, too, has made the application delivery environment more dynamic and complicated — and, therefore, more problematic for IT departments. The three trends mentioned above — customer experience, increasing hybrid and multi-cloud adoption, and new development methods, such as micro-services — are all contributing to an increased need for visibility regarding application performance and security. So, how can organizations maintain the level of visibility that they need in order to do business properly? There are, in essence, three facets of visibility for today’s IT environments, each one of them crucial: data collection, analytics and action. One of the greatest visibility challenges is, put simply, the sheer quantity of data that enterprises generate. Whether the source of this data is Azure, AWS, or an on-premises system, it needs to be collected and brought to a central location before being analyzed and acted on. The good news is that key sources of data, such as NetScaler instances, are already placed strategically across your application delivery network, can see all the traffic, and can collect rich data on applications, users, and performance. Data analytics is all about getting the right information to the right people at the right time. Hidden deep within organizations’ data are countless insights that can shed light on issues pertaining to user behavior, security threats, application performance, customer experience, and more. Even when you’re able to collect and analyze your organizational data, obtaining actionable insights is often a challenging task — again, due to the sheer quantity of information. While human minds may be too limited to fully process all of this data, artificial intelligence and machine learning techniques can establish baselines, find patterns, and highlight important trends and anomalies. IT leaders need to take control and increase visibility for their applications, but it’s equally essential that they delegate and give important information to members of the security, network and cloud operations teams. 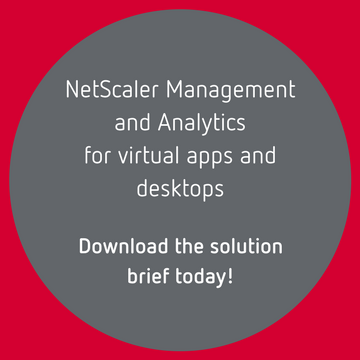 Solutions, such as Citrix NetScaler, are able to provide fine-grained, granular, role-based access to valuable analytical insights. In turn, these problems and potential issues, once identified, must be addressed as quickly as possible, before they escalate. Automation will be key here, in order to close the loop, so that policies can be applied and modified in real time without the constant need for human approval. For example, if a user account is behaving strangely, IT policies can be changed automatically, so that the user is immediatetely prevented from accessing the same level or quantity of data. What Benefits Does Visibility Bring? There are two main advantages of greater application oversight: higher performance and better security, both of which affect customer experience. Your applications must deliver exactly the experience that your customers expect and that you need to provide. To make sure you’re doing this, you need to collect data about how the applications are used and correlate it with your system’s information on their performance. NetScaler and other solutions can provide scoring systems that rate how well applications are performing, letting you drill down into the specifics, if necessary. This detailed information helps you get to the bottom of any issues faster and conclude your troubleshooting processes faster. Today’s application delivery infrastructures are faced with an ever-present array of severe IT security threats. As more software moves into the cloud, security becomes more than simply protecting the perimeter of your data center. Bits and pieces of your applications may be scattered all over the place, either in public clouds or on-premises. As a result, you need to work to manage and contain the security threats trying to break your applications (and, in turn, your business). Your organization needs IT security products that can identify application-level threats in a variety of cloud and on-premises environments, make these threats visible, and take steps to mitigate them. Finally, you need to take account of the shift to newer identity-centric security models that reflect the shifting security perimeter, as cloud adoption accelerates. This means capturing and acting on insights related to user and client behavior. Citrix understands the complex visibility challenges posed by greater cloud adoption. With innovations in data collection to analytics and automation, Citrix is working to provide businesses with the application-level visibility that they’ve come to need and expect, as they move workloads to the cloud and deploy cloud-native applications.